Switch off the engine, ignition and the mobile telephone before filling the tank and leave them switched off during the process. Unlock the vehicle using the vehicle key or the button in the driver door . The tank flap is at the rear of the vehicle on the right. 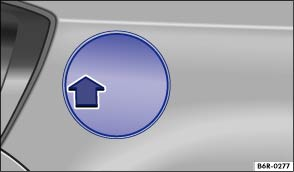 Press on the tank flap in the direction of the arrow . The tank flap will spring open slightly. Open the tank flap fully. Turn the tank cap anticlockwise and hook it on top of the tank flap . The correct fuel grade for your vehicle is shown on a sticker on the inside of the tank flap . The fuel tank is full when the (properly operated) automatic filler nozzle clicks off for the first time . Do not continue filling the tank after it switches off. The expansion space in the fuel tank will otherwise fill up and the fuel could spill out. This could also happen when the fuel warms up and expands. 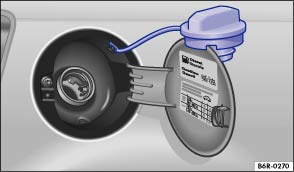 Turn the tank cap clockwise into the fuel filler neck until it perceptibly engages. Close the tank flap so that it engages audibly. The tank flap must be flush with the vehicle bodywork. Do not continue filling the tank once the filler nozzle stops automatically. The fuel tank could be overfilled. This can cause fuel to splash out and overflow. This can cause fires, explosions and serious injuries. Remove spilt fuel from the vehicle paint as quickly as possible in order to avoid damage to the wheel housing, tyres and vehicle paint. Spilt fuel can pollute the environment.